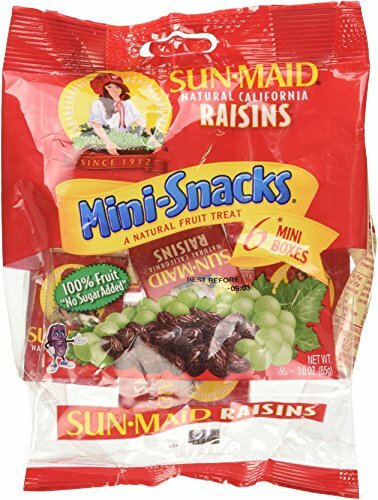 Delicious Sun-Maid Raisins are the healthy alternative to a quick snack. With quality, taste, convenience and the all-natural goodness you remember. Included are 12 bags of 6 mini boxes each. A bargain total of 72 boxes! Sun-Maid is an easy way to make sure you always have raisins in the home. With Sun-Maid Raisins, you get it all - quality, taste, convenience, and all-natural goodness. Sun-Maid Raisins go anywhere, are 100% natural, won't spoil, and don't need refrigeration. Sprinkle them on your cereal or on your salads, mix them with munchies, stir them into your favorite recipes, or just eat a handful for a quick energy boost. If you have any questions about this product by Sun Maid, contact us by completing and submitting the form below. If you are looking for a specif part number, please include it with your message.